BlackBerry BB.T +9.33% may no longer be doomed, but what it will look like in a year remains up in the air. BlackBerry wants to shed its dependence on selling smartphones in favor of software and services mainly for enterprises to manage their fleets of mobile devices. Thursday’s quarterly results offered several encouraging signs for this effort. Adjusting for one-time items, BlackBerry’s loss of 11 cents a share was less than half what analysts expected. And service revenue came in 9% above Wall Street’s estimates. The stock duly jumped on Thursday. But that owed at least something to the high proportion of BlackBerry’s shares sold short. And one quarter does not a turnaround make. BlackBerry says it is at the “tail end” of restructuring efforts that have effectively been under way for more than two years. It must now demonstrate that it can be a profitable services company. Yet hardware will remain part of the picture, which should give even investors pause. On Thursday’s conference call, Chief Executive John Chen said BlackBerry plans to hold an event in September to showcase devices planned for the current fiscal year. These will include the Passport and the Classic, both of which are expected to feature the physical keypad that is popular with BlackBerry loyalists. As for the software-and-services end of the business, the full picture has yet to emerge. The firm launched the EZ Pass program in March to switch over business customers to its BlackBerry Enterprise Service 10 offering for free, including new customers coming from rivals. BlackBerry said Thursday more than 2,600 customers have registered under the program. But they won’t begin paying support fees until January 2016, so it will take time to gauge whether the effort has paid off. 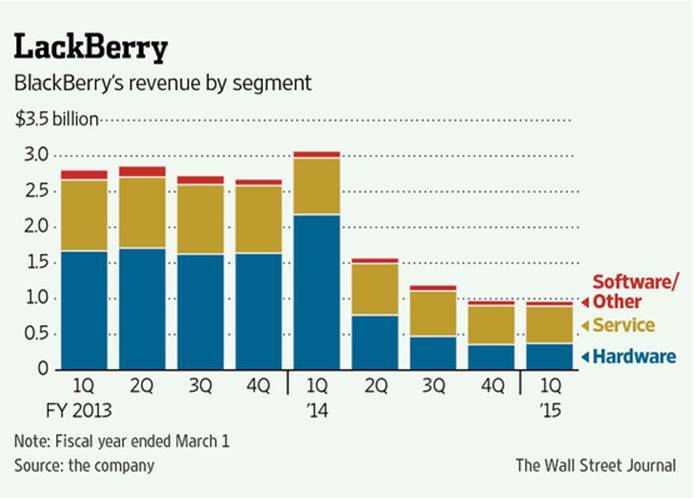 BlackBerry trades at only about 1.3 times forward sales. That might look cheap given the potential for the turnaround to gain traction. Given the competitive pressure that continues to squeeze BlackBerry, though, more evidence is needed before buying in.